Have a Valentine’s Day confession you want to share? 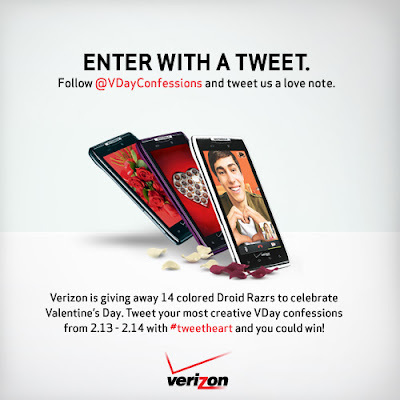 Verizon Wireless is awarding 14 Droid RAZRs in the color of your choice to the most creative confessions sent to their twitter handle, @VDayConfessions. Ready to win? Simply follow @VDayConfessions on Twitter and tweet your most creative love notes, confessions and love declarations to the @VDayConfessions Twitter handle on Monday, February 13th and Tuesday, February 14th. Be sure your entry includes #tweetheart in your tweet for prize consideration. Click here for complete Verizon Wireless VDay Confessions Contest rules.